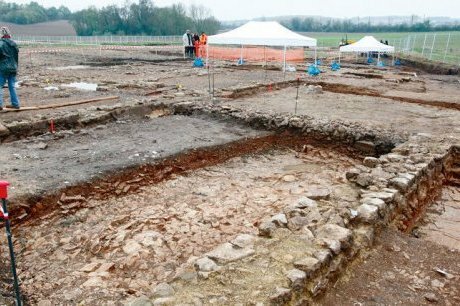 FRANCE – Linars - Dans le cadre du chantier de la LGV Tours-Bordeaux, des fouilles d'archéologie préventive ont été menées à Linars, sur le site de La Fouillère. Elles ont permis de mettre à jour les fondations d'un bâtiment médiéval : une maison de 20 mètres de long, sur 6 à 8 mètres de large, avec trois pièces de vie. Plusieurs sols d'occupation et différents foyers ont pu être observés. Les analyses permettront d'appréhender le cadre de vie des habitants au XIVe siècle. FRANCE – Narbonne - L'épopée du Prince Noir a laissé des traces à Narbonne où les faubourgs médiévaux ont été saccagés, pillés, et incendiés. 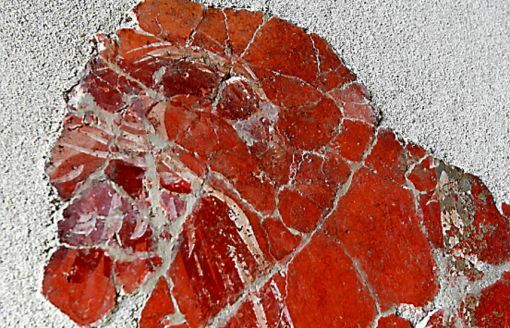 Au moment de la construction de la Médiathèque en coeur de ville, les archéologues de l'INRAP de Marseille ont non seulement dégagé des traces de cette présence au moyen-âge, mais aussi, au dessous, un niveau gallo-romain. Des éléments du passé antique qui attestent une fois de plus la vie dans ce quartier, du milieu du Ier siècle avant J.-C. jusqu'au Ier siècle après J.-C. "Les belles demeures romaines du centre ont été réalisées par des ouvriers italiens, explique l'archéologue Narbonnais, spécialiste des peintures romaines Raymond Sabrié. Elles étaient avenue Mistral, rue Littré, et boulevard de Gaulle, là où on a retrouvé des peintures exceptionnelles, comparables aux plus belles peintures italiennes. Dans la périphérie proche de Narbonne, après le Clos, une zone artisanale s'étend du côté du quai d'Alsace. Là, l'habitat était modeste". Les enduits peints sont des révélateurs . Les fouilles préventives imposées par la loi aux promoteurs ont permis de repousser plus loin la connaissance de cet habitat. Au départ, il était concentré au coeur de la cité, puis progressivement, les personnes aisées et influentes ont déserté la ville, pour s'établir en périphérie. Ces personnalités ont implanté des villas sur des grands terrains plantés de vignes et d'oliviers où elles se sont appliquées à reproduire la civilisation italienne. L'architecture et la décoration sont de précieux indicateurs des catégories sociales. Parmi ces éléments, les enduits peints, sont autant de révélateurs. "On monte dans l'échelle sociale, explique Raymond Sabrié, partant de motifs géométriques puis des plantes jusqu'aux animaux, enfin les figures humaines, retrouvées dans les maisons luxueuses. Les peintures parlent : un décor est adapté à une pièce, à la maison, elle-même liée au niveau social, insérée dans un quartier. L'architecture et la décoration ont ainsi diffusé la romanité. L'aigle a servi de support à la propagande impériale, il représentait le génie de l'empereur. On l'a retrouvé dans les lieux publics et chez les personnages qui avaient une charge publique". ITALIE – Monticello - The village of Monticello - near Finale Ligure, in the west of Italy, is located along the western slopes of Gottaro. 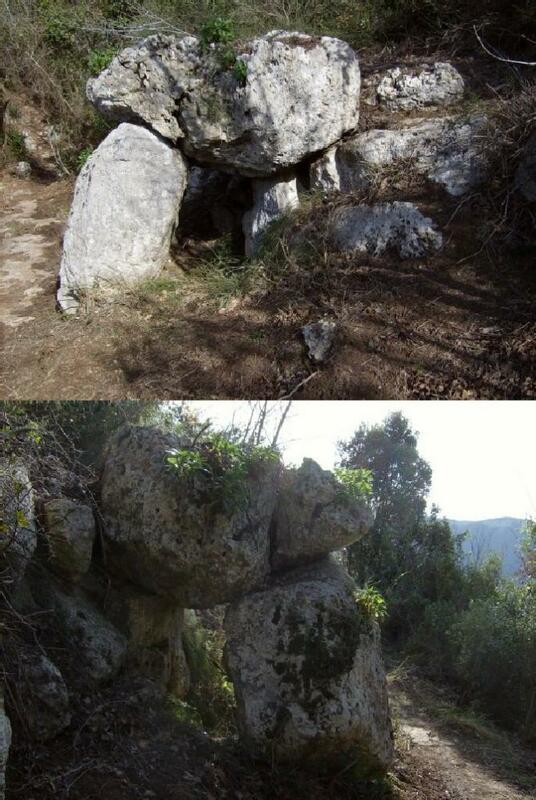 The dolmen is located in Valeggia, 199 metres above sea level along the northern slopes of Bric delle Pernici. The dolmen is made of limestone, about 250 centimetres high, with a horizontal cap stone supported on one side by a single stone, and on the other side by two large stones and a sort of dry wall. The chamber has a maximum height of 1 metre. The cap stone has a transverse V-shaped crack, and the top is eroded, but some erosion could be interpreted as a petroglyph and even as cup marks. A larger depression is similar to those found on the Stone-Altar above ArmaÂ Strapatente, and might have had the function of collecting liquid, and therefore a ritual significance. The floor of the chamber has not been probed, since the complex has been considered the result of a landslide, but the arrangement is not typical of a landslide. Dolmens and menhirs are not strangers to the Finalese and Subalpine cultural zones, as thought until a few decades ago, when it was believed that the megalithic culture had been arrested without crossing the Alps. The only exception was Puglia, in southern Italy. There the dolmens and other megaliths were attributed to the influx of populations from the Balkan Peninsula, across the Adriatic. In the late 1980s, two circular burial mounds were identified near Sanremo, Imperia province, one of which was attributed to the final phase of the Bronze Age. Accordingly, other Ligurian artefacts - especially in the Finalese (the menhir and dolmen of Verezzi, for example) - acquired new importance, and the lack of megalithic remains in Italy could be explained by the change of civilisation over time, resulting in the loss of many sites. The creation of megalithic structures, such as menhirs and dolmens, is placed in a period between the end of the fifth millennium at the end of the third millennium BCE, roughly between the Neolithic and the Bronze Ages, and corresponding with that of other megaliths already described by experts and by the author, in the vicinity of Monticello - such as the rudimentary anthropomorphic Stele of 'Pila delle Penne', Plateau of St Bernardino (including the so-called Observatory of Bric Pianarella) - but also other megaliths of Finalese. 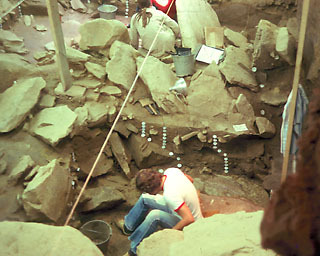 USA – Meadowcroft Rockshelter - If not for the curiosity of a Washington County, Pa., farmer nearly six decades ago, Meadowcroft Rockshelter -- the oldest site of human habitation in North America -- might have never been discovered. In 1955, Albert Miller stumbled upon a groundhog hole on his family's farm in Avella and uncovered what looked to be a prehistoric tool. He chose to cover up the hole and carefully search for a professional archaeologist who could properly assess the historical significance of the site. Almost two decades later, in 1973, Miller finally contacted University of Pittsburgh anthropology professor James Adovasio to visit the farm and look at the object. Astonished by the artifact, which was a prehistoric flint knife, the professor assembled a team of archaeology, anthropology and geology students to study the area as part of a curriculum. The field school's excavation of the site over the next six years yielded nearly 2 million artifacts and ecofacts, including ancient stone tools, pottery particles and evidence of ice-aged fire pits. Further testing of the artifacts concluded that the rock ledge overhang -- naturally formed by the waters of Cross Creek -- served as a campsite for prehistoric hunters and gatherers 16,000 years ago. Meadowcroft Rockshelter provided shelter for visitors with nearby fresh water springs and sources of plants and animals for food. ROYAUME UNI – Blar na Léine - In true Highland fashion, the men of Clan Fraser clashed with their foes the MacDonalds, hewing at each other with battleaxes and claymores. Legend has it the combatants stripped off their chain-mail in the heat of the summer sun and fought in their shirts as the exhausting work of killing foes dragged on. Such was the slaughter that only a handful of men were said to have survived on each side, while the dead were laid to rest in unmarked graves and all but forgotten by history. But now the site of Blar na Léine – the 1544 "Battle of the Shirts" – is to be included in a group of new battlefields to be protected from development so that future generations can study them and add to the understanding of Scotland's past. Among those selected are the Battle of Glenlivet in 1594 which saw the 2000-strong army of George Gordon, 1st Marquess of Huntly, smash a force of footsoldiers five times its size belonging to the Earl of Argyll through the use of cannon and cavalry power. Also included is the site of Robert The Bruce's victory at Loudon Hill in Ayrshire, in 1304, and a minor struggle from the Wars of Independence at Dunbar in 1296 where Scottish King John Balliol's men were routed, though history claims they only lost one knight. 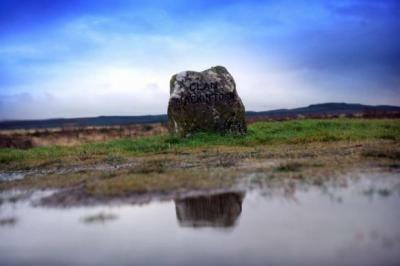 A place has also been found on the list for the Battle of Dunkeld in 1689, where the first Jacobite rebels met defeat. Studies of the battlefield have found cracks in the walls of the nearby ruined cathedral caused by the volleys of musket fire that broke the Highlanders' ranks.